Nestled at the top of Stourport-on-Severn’s High Street is The Swan which, although you might not think it from the outside, offers a treasure trove of musical history within its walls. Fans of the golden age of rock (and roll) could easily spend an afternoon perusing the cuttings and photographs which act as the wallpaper, not to mention the impressive collection of guitars. But what makes this venue even more special is the punters; here to enjoy the music without the need to talk to their neighbour when the band play, push their way to the front or spend the evening with their eyes locked on their phones. 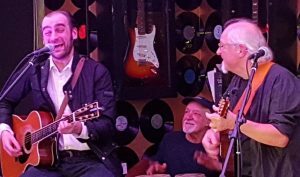 The Swan offers music lovers the chance to appreciate a gig in the most pleasant of surroundings, and you will be rubbing shoulders with like-minded individuals and (maybe) the odd Rock legend or two. Since parting ways with Jethro Tull, Martin Barre has been afforded the chance to explore new avenues musically and has released four acclaimed solo albums in the past five years including 2018’s Roads Less Travelled. 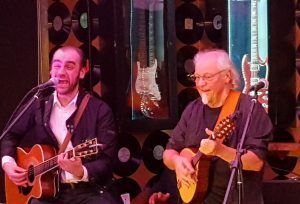 After a full band show the previous evening at The Robin tonight he was in acoustic mode, accompanied only by vocalist/guitarist Dan Crisp, and the pair performed a set that took in solo work, covers and a few Tull classics. And after spending decades on stage letting his guitar do the talking Martin is proving to be an engaging raconteur, with pre-song anecdotes that included growing up in Birmingham with lino on every floor of the house and the perils of French hotel rooms. In Dan Crisp he has found a terrific vocalist who was equally comfortable with the soulful renditions of ‘Can’t Find My Way Home’ and ‘New York Minute’ and the likes of ‘Wond’ring Aloud’ from the Tull catalogue. Although informing the audience that he couldn’t play the Blues (slightly ironic given the high regard in which he is held by Mr Bonamassa), Martin’s guitar playing remains distinctive and unique and he still plays with a simply sublime fluidity. Not that he was the only septuagenarian to grace the stage as he called upon original Tull drummer Clive Bunker to help out on a couple of numbers that made the evening even more special. The pair are soon to be reunited with Dee Palmer to tour the States with a fifty years of Tull show that will hopefully reach the UK in due course. After delighting the crowd for a couple of hours they concluded with, naturally, ‘Locomotive Breath’ to round off what was an outstanding performance in an incredible venue; you really couldn’t ask for anything more.